>>1. 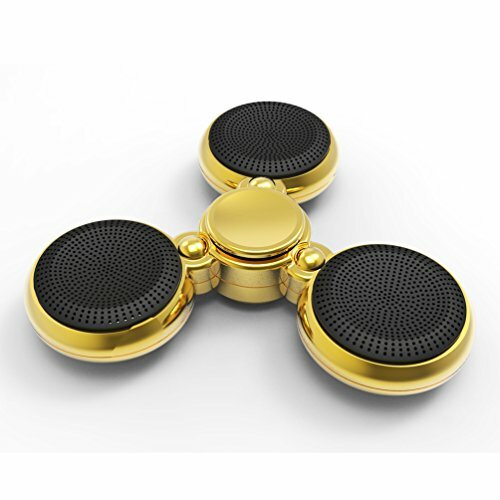 "Hands-Free-Call Spinner" - Unique new design, there is a HF microphone included, so that you could answer your cellphone with this spinner, completely become a portable wireless bluetooth speaker, pocket loudspeaker for your cellphone and laptop, hold the button switch 1 second to start phone call. (Find metal type in "Promotion"). >>2. "Exquisite Plated Shiny"- Although inner material is plastic(abs), but the surface is plated very exquisitely so that it looks like made by metal, exquisite UL plating process enhance its abrasion performance and durability. The spinner is smooth, shiny and good touch feeling, just like our picture show. (Find metal type in "Promotion"). >>3. "High-Grade Better Loudspeaker"- You could compare this speaker with other spinner speaker, under this kind mini size we choose the best quality speaker type for you, much less cracking voice and could support higher sound volume. Have a try, our after-service return&refund will protect you if you are not satisfied. (Find metal type in "Promotion"). >>4. "Magic LED Pattern Pictures"- Colorful led light, along with your music and rotate, the colorful led will build various picture pattern and auto changed each 5 seconds, very funny and never bored any longer. Charge the spinner with your Android cellphone USB cable in 1 hour(red indicator light), then hard keep press the button in 4 seconds to turn on/off. >>5. "USA Trademark YJY"- Brand YJY for service guarantee and "YJY Home" is the only store, we always try our best to find the best quality product for Amazon buyer, fast and reliable delivery, even if your order is non-prime and shipped from oversea warehouse by USPS, USA buyer could also receive it in 8-14 days. (if you find "Prime" out of stock, add this page to your "Wish List", it will be replenished in 2-4 days. ).